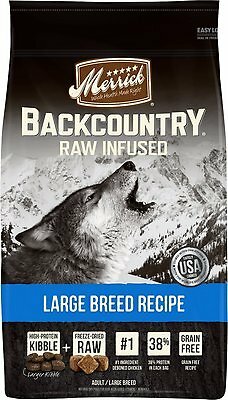 Merrick Backcountry Raw Infused Large Breed Recipe Dry Dog Food is an all-natural, grain free ancestral canine diet packed with protein your big best friend will crave. 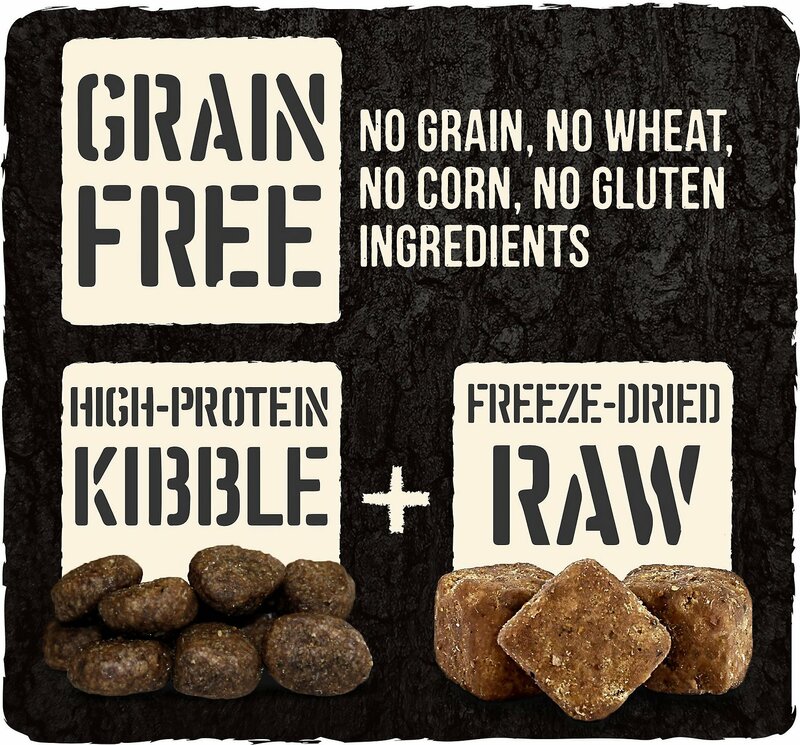 The unique raw-infused kibble recipe delivers a perfect combination of protein-rich, grain-free kibble along with real, whole pieces of raw, freeze-dried chicken. Real, wholesome fruits and veggies like sweet potatoes, peas, apples and blueberries are added for vital nutrients and fiber. Give your huge hound the nutritional benefits of a raw diet like he would have discovered in the wild, now in a safe and convenient recipe that's easy to serve. Deboned chicken is the first ingredient, along with raw, freeze-dried chicken pieces for a taste, texture and aroma your big dog will crave. 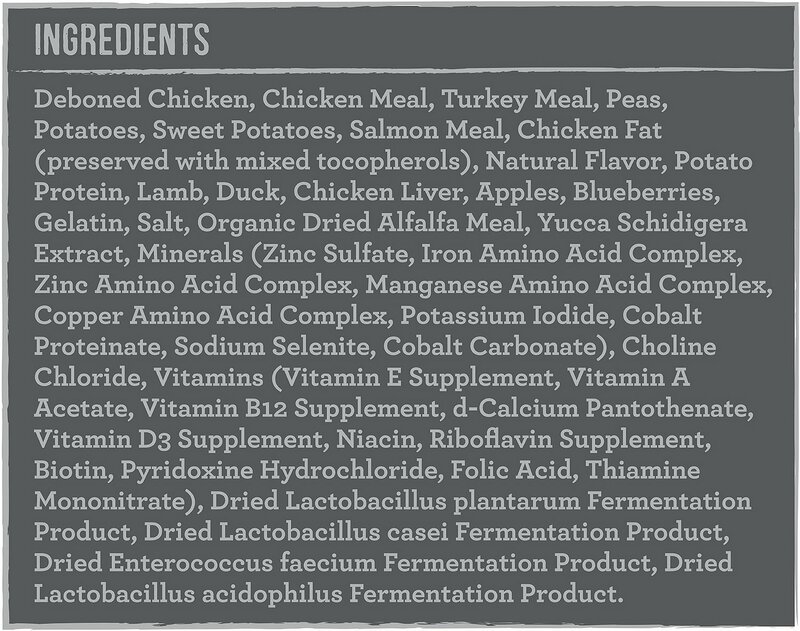 Deboned Chicken, Chicken Meal, Turkey Meal, Peas, Potatoes, Sweet Potatoes, Salmon Meal, Chicken Fat (preserved with mixed tocopherols), Natural Flavor, Potato Protein, Lamb, Duck, Chicken Liver, Apples, Blueberries, Gelatin, Salt, Organic Dried Alfalfa Meal, Yucca Schidigera Extract, Minerals (Zinc Sulfate, Iron Amino Acid Complex, Zinc Amino Acid Complex, Manganese Amino Acid Complex, Copper Amino Acid Complex, Potassium Iodide, Cobalt Proteinate, Sodium Selenite, Cobalt Carbonate), Choline Chloride, Vitamins (Vitamin E Supplement, Vitamin A Acetate, Vitamin B12 Supplement, d-Calcium Pantothenate, Vitamin D3 Supplement, Niacin, Riboflavin Supplement, Biotin, Pyridoxine Hydrochloride, Folic Acid, Thiamine Mononitrate), Dried Lactobacillus plantarum Fermentation Product, Dried Lactobacillus casein Fermentation Product, Dried Enterococcus faecium Fermentation Product, Dried Lactobacillus acidophilus Fermentation Product. 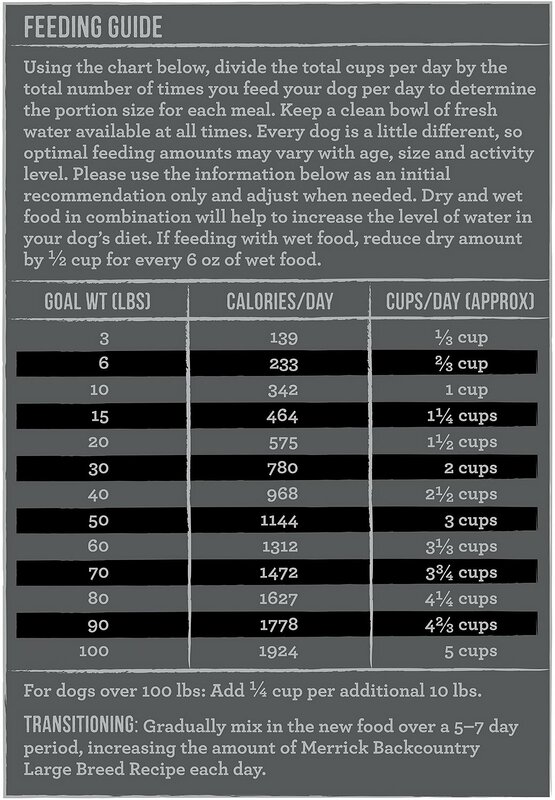 Using the guide above, divide the total per day by the total number of times you feed your dog per day to determine the portion size for each meal. Keep a clean bowl of fresh water available at all times. 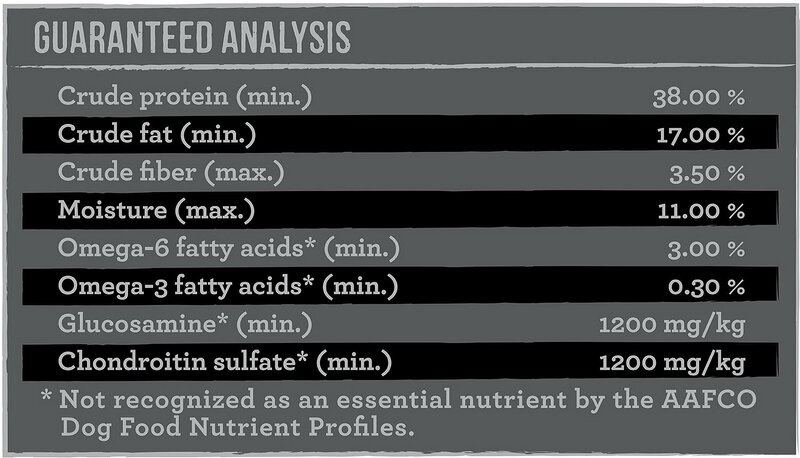 Every dog is a little different, so optimal feeding amounts may vary with age, size and activity level. Please use the information provided as an initial recommendation only and adjust when needed. 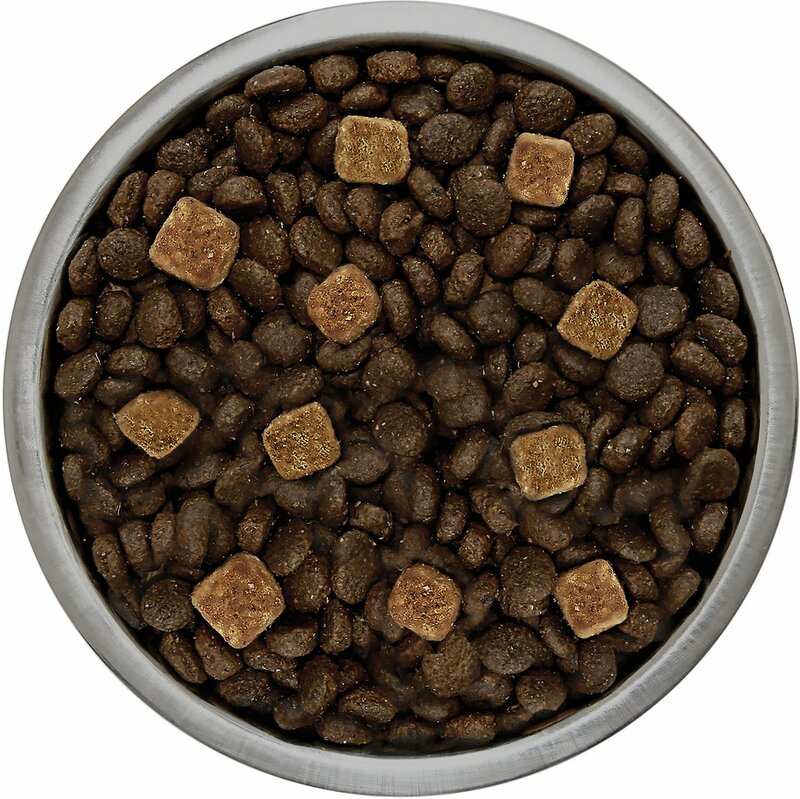 Dry and wet food in combination will help to increase the level of water in your dog's diet. If feeding with wet food, reduce dry amount by 1/2 cup for every 6 oz of wet food. Dogs crave a protein-rich diet, the way nature intended. Give your dog what he craves with Merrick Backcountry’s all-natural, grain-free ancestral canine diet. Every Backcountry recipe features deboned meat, poultry or fish as the number one ingredient, and always includes a mix of proteins for a balanced diet that your dog would have discovered in the wild. All recipes are cooked in the USA in Merrick’s own organically certified kitchens. Each meal and treat has the freshest, highest quality ingredients sourced from trusted farmers and ranchers across the country, all four seasons of the year. Merrick only uses the freshest ingredients without additives, sweeteners, colors or preservatives. To lock in fresh taste and maintain nutritional benefits in their purest state, every serving of Merrick’s Backcountry dry dog food has freeze-dried real raw meat, poultry or fish pieces. 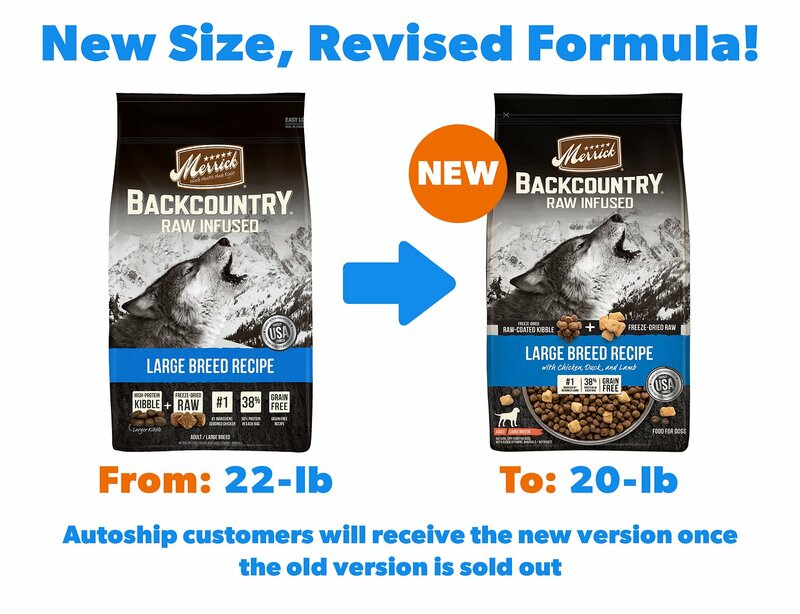 Merrick Backcountry’s Raw Infused kibble recipes deliver the perfect combination of protein-rich kibble plus real, whole pieces of raw, freeze-dried meat, poultry or fish in a safe, convenient recipe that’s easy to serve. Merrick Backcountry's grain-free wet food options include hearty stews, dinner with tender chunks of meat, and loaf-style 96% meat recipes―all rich in protein and flavor. You can easily add moisture to your dog’s diet and provide him with the complete and balanced nutrition he needs and the taste he loves. Pups love the texture and taste of Backcountry’s jerky, patties, sausage cuts and freeze-dried raw treats and mixers. Treat your dog to the natural taste he craves with treats and mixers that always have deboned meat, poultry or fish as the number one ingredient and absolutely no artificial ingredients or fillers. My GSDs all love Merrick Backcountry varieties. They’re healthy, energetic, with thick beautiful coats. The first couple of bags my English Mastiff loved, then by the third bag, not so much. Seemed like there were more waste at the bottom of the bag. You know, the dusty particles. When he'd go to eat it, it would turn into this paste. He just started to eat the freeze dried meat out. I finally started to add some shredded chicken, rice and green beans to get him to finish the bag. I transitioned him into the Chicken Sweet Potato Merrick. Not a bad product, just not for my Otis. 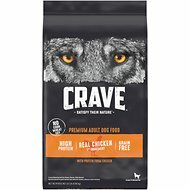 Changed to this food because Chewy ran out of my dogs other food.But I have to say this is better, I feed her less on this food as it has less waste and she (Great Dane) loves it. She actually asks for her dinner which rarely has ever happened in her 7 years. She's looks forward to and is excited about her meals. But that’s about all. My picky pooches would pick out the good stuff. Leaving me to sweep up the rest. I’m not sure if I’ll order it again but I might try another variety of Backcountry before I give up on that brand. My dog won't eat it! I'm so disappointed. 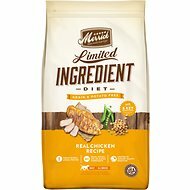 I researched dog food, as my Aussie turned one year old and was taking her off puppy food and I thought this would be the best. But she won't eat it...even if I put raw boost on it or even fresh cooked chicken. My dogs loved the taste of this food but the dog food gave them very loose stools and terrible gas. Could be related to the number of forms of proteins in the food. The dogs were getting bored with their normal variety of Merrick Limited Ingredient or the Grain Free Chicken and Sweet Potato, but every time I pour out the Raw Infused, they clean up everything in the bowl and just keep licking. I think we have a winner! Dog liked it but . . .
My dog is pretty picky when it comes to his dog food. He did like this food but he ate it too fast. I wish the kibble was bigger especially considering this is for large breeds. Recently adopted a rescued Great Pyrenees - my new girlfriend, Sophie! After going to TopDog Food Advisor, I decided to give Merrick a try. She is getting along well with both the dry & canned. No stomach issues at all. Will continue to buy this brand. Rates 5 stars. I like the ingredients & the fact that it contains real meat chunks.